Welcome at the website of ASSIST in Christ! The name ASSIST stands for: ‘Assist South Sudan In Strengthening Teachers’. The initiators Hilde van der Draai (from the Netherlands) and Daniel Ohide (from South Sudan) have the passion to strengthen teachers in South Sudan through Christ-centered training. 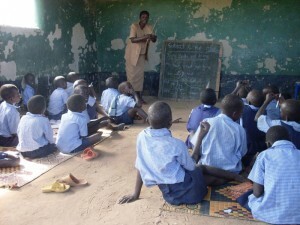 There is a need for quality education in the (post-) conflict country South Sudan. In 2011 only 13% of the Primary and Secondary School teachers have a certificate, many teachers lack the skills and motivation to teach. In 2011 Daniel Ohide started a teacher training in Emmanuel Christian College together with Mount Meru Universiteit in Tansania. The participants of this 3 year- training receive a Diploma in Education. In 2012 Hilde van der Draai joined Daniel in the mission and the certificate program for untrained teachers in the field was initiated. Through training during holidays and through guidance during their practical teaching, teachers strengthen their competences and motivation to teach. The teacher training at Emmanuel Christian College strengthen the student to become effective Christian teachers in the future. Everything we do is only meaningful to us if we do it In Christ. We use His Word as the foundation and we want to Glorify God through our work.